Inaugurated on March 10, 2011, Situation: Auto Duration occupied the large room at Clark. The pile, displayed differently, lay on a wooden pallet in the center of the space. A graphite line drawn around the circumference of the gallery, which has since been erased, marked the initial height of the stack of 3000 publications. From the start, the work was as much an event as it was an installation. Initially, the gallery appears deceptively bare, a single pile of publications in the middle of the otherwise empty gallery. Upon entering the space, the viewer crossed the perimeter of the work as delineated by the line traced on the wall, and became a participant in an event activated by Mastroiacovo. Under these circumstances, taking a copy was not an insignificant gesture. 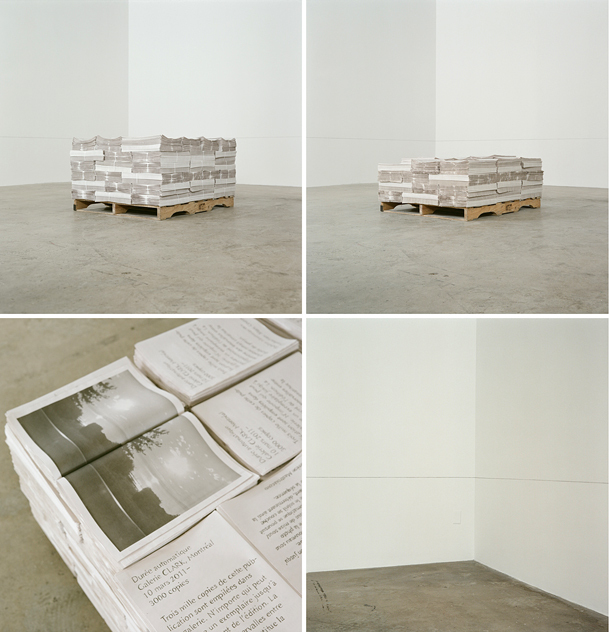 By removing a copy from the pile, the viewer chose to participate in the work itself, accepting to take part in its unfolding by accelerating the process that would lead to its completion: the dissemination of each copy of the publication within an undetermined time frame beyond the control of the artist. The responsibility given to Clark’s visitors by Mastroiacovo attests to her faith in them, and of her confidence in their insight and investment in the artistic experiences proposed to them. Not only did she share part of her creative process by accepting that the evolution of the work would no longer be determined exclusively by her, she also allowed viewers the possibility of inscribing their gestures within a greater, unifying cycle, each gesture adding up to the completion of the project. Ultimately, it was an act of generosity on the part of the artist, made concrete through the gift of an ephemeral multiple. A generous act that perpetuates itself, since not all 3000 copies were taken within the allotted 38 days of the exhibition, an eventuality that was considered during the initial conception of the project. By accepting to present Situation: Auto Duration, Clark agreed to maintain the availability and presentation of the publications until the actual end of the project; a commitment with consequences the center could not feasibly measure, beyond attempting to approximate its rate of visitors. Its current state was negotiated during the dismantling of the exhibition, and may need to be negotiated again should future relocations become necessary, meaning the work remains in flux. No longer completely the domain of the artist, nor that of the center, which could eventually decide to terminate the project, Situation: Auto Duration rests in the hands of the viewer, the only entity who can legitimately bring the work to its conclusion. This tension around duration, at the heart of the work, is also reflected in the content of the publication. Although a sunset is a phenomenon with a determined duration, a defined beginning and end, it is through its parallel within broader cycles, that the true scope of the work is felt. A situation that operates much like the one occurring in the gallery, where the act of taking, autonomous and complete in itself, must be considered not in terms of its singularity, but as one variable added to a whole, which leads us to the completion of the work. Other parallels in the installation also reflect the publication’s content, thereby uniting the project – the measuring line on the wall evokes a horizon, the dwindling piles recall the sinking of the sun. Likewise, the artist’s relinquishment of control of the work in the gallery is paralleled in her process of taking the photographs, bound instead by the automatic shut-off function of the camera. Like the work in the gallery, the artist does not determine the duration of the situation. Ultimately, Situation: Auto Duration calls attention to the responsibilities of artists, administrators, and viewers, and marks their participation in this situation. Thérèse Mastroiacovo manages to make us reflect on the definition of art and our relationship to it – a relationship the publication we’ve taken home with us so vividly recalls each time we look at it.